Hard as it is to forecast sales, it's harder to run a business without a sales forecast. Here's how to forecast sales for a new business or ongoing business. Continuing with my series on standard business plan financials, you can’t run a business, or start a new business, without a sales forecast. Whether you have a full business plan, or a lean business plan, or just a collection of spreadsheets, a proper sales forecast ought to become like a dashboard, meaning it’s a tool you use to check plan vs. actual results, see problems developing, and correct your day-to-day with the progress of your sales. Sales of some number mean nothing without the context the sales forecast gives you. For example, $100 isn’t good or bad on it’s own; but it’s bad if you expected $150, and good if you expected $50. The expectations make it real. Your sales forecast won’t accurately predict the future. We know that from the start. What you want is to understand the sales drivers and interdependencies, to connect the dots, so that as you review plan vs. actual results every month, you can easily make course corrections. Sure, people shy from doing forecasts, because it can feel like real numbers and you can think only the numbers people can do it. Don’t believe that. You don’t have to have an MBA degree or be a CPA. You don’t need sophisticated financial models or spreadsheets. I was a vice president of a market research firm for several years, doing expensive forecasts, and I saw many times that there’s nothing better than the educated guess of somebody who knows the business well. All those sophisticated techniques depend on data from the past. And the past, by itself, isn’t the best predictor of the future. You are. So let’s look at how to forecast sales, step by step. Your sales forecast is also the backbone of your business plan. People measure a business and its growth by sales, and your sales forecast sets the standard for expenses, profits and growth. The sales forecast is almost always going to be the first set of numbers you’ll track for plan vs. actual use, even if you do no other numbers. If nothing else, just forecast your sales, track plan vs. actual results, and make corrections; that’s already business planning. It should be obvious: Make sure the way you organize the sales forecast in rows or items or groups matches the way your accounting (or bookkeeping) tracks them. Match your chart of accounts, which is what accountants call your list of items that show up in your financial statements. If the accounting divides sales into meals, drinks, and other, then the business plan should divide sales into meals, drinks, and other. So if your chart of accounts divides sales by product or service groups, keep those groups intact in your sales forecast. 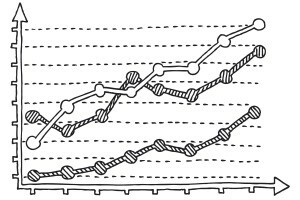 If bookkeeping tracks sales by product, don’t forecast your sales by channel instead. If you’re planning for a startup business, coordinate the bookkeeping categories with the forecasting categories. Get your last Income Statement (also called Profit & Loss) and keep it in view while you develop your future projections. If you don’t have more than 20 or so each rows of sales, costs, and expenses, then make the rows in the projected statement match the rows in the accounting. If your accounting summarizes categories for you – most systems do – consider using the summary categories in your business plan. Accounting needs detail, while planning needs a summary. If your categories in the projections don’t match the accounting output, you’re not going to be able to track plan vs. actual well. It will take retyping and recalculating. 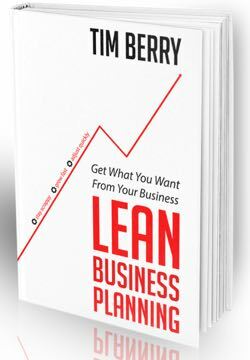 And you’ll lose the most valuable business benefit of business planning: management, steering your company. If you’re a LivePlan customer, don’t worry about this spreadsheet view, which is generic. LivePlan will guide you through the sales forecast assumptions and do the calculations automatically. 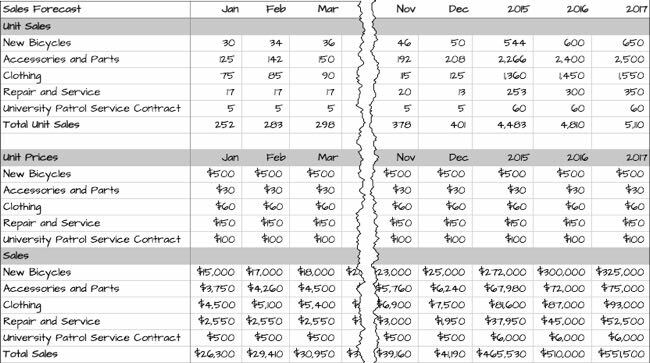 For the generic spreadsheet option, shown here, you multiply units times prices to calculate sales. For example, unit sales of 36 new bicycles in March multiplied by $500 average revenue per bicycle means an estimated $18,000 of sales for new bicycles for that month. Total Unit Sales is the sum of the projected units for each of the five categories of sales. Total Sales is the sum of the projected sales for each of the five categories of sales. Calculate Year 1 totals from the 12 month columns. Units and sales are sums of the 12 columns, and price is the average, calculated by dividing sales by units. The numbers for Year 2 and Year 3 are just single columns; unless you have a special case, projecting monthly results for two and three years hence is overkill. It’s a problem of diminishing returns; you don’t get enough value to justify the time it takes. Other experts will disagree, by the way; and there may be special cases in which extended monthly projections are worth the effort. A normal sales forecast includes units, price per unit, sales, direct cost per unit, and direct costs. Direct costs are also called COGS, cost of goods sold, and unit costs. COGS stands for Cost of Goods Sold, and applies to businesses that sell goods. COGS for a manufacturer include raw materials and labor costs to manufacture or assemble finished goods. COGS for a bookstore include what the storeowner pays to buy books. COGS for Garrett are what he paid for the bicycles, accessories, and clothing he sold during the month. Direct costs are the same thing for a service business, the direct cost of delivering the service. So, for example, it’s the gasoline and maintenance costs of a taxi ride. Direct costs are specific to the business. The direct costs of a bookstore are its COGS, what it pays to buy books from a distributor. The distributor’s direct costs are COGS, what it paid to get the books from the publishers. The direct costs of the book publisher include the cost of printing, binding, shipping, and author royalties. The direct costs of the author are very small, probably just printer paper and photocopying; unless the author is paying an editor, in which case what the editor was paid is part of the author’s direct costs. 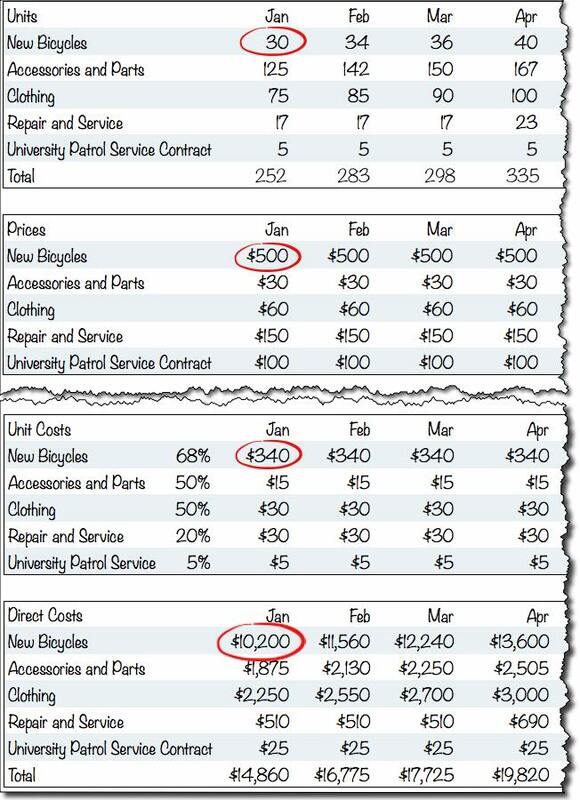 The illustration below shows how Garrett uses estimated margins to project the direct costs for his bicycle store. For the highlighted estimates, the direct entry for bicycles unit cost is the product of multiplying the price by 68 percent. The total direct costs for bicycles in January are the result of multiplying 30 units by $340 per unit. And here again, LivePlan users don’t need to do these calculations; your software does it automatically. Standard accounting and financial analysis have rules about sales and direct costs and timing. A sale is when the ownership of the goods changes hands, or the service is performed. That seems simple enough but what happens sometimes is people confuse promises with sales. In the bike store example, if a customer tells Garrett in May that he is definitely going to buy 5 bicycles in July, that transaction should not be part of sales for May. Garrett should put those 5 bicycles into his July forecast and then they will actually be recorded as sales in the bookkeeping actual sales in July when the transaction takes place. In a service business, when a client promises in November to start a monthly service in January, that is not a November sale. Direct costs also happen when the goods change hands. Technically, according to accounting standards (called accrual accounting), when Garrett the bike storeowner buys a bicycle he wants to sell, the money he spent on it remains in inventory until he sells it. It goes from inventory to direct costs for the income statement in the month in which it was sold. If it is never sold, it never affects profit or loss, and remains an asset until some day when the accountants write off old never-sold obsolete inventory, at which time its lowered value becomes an expense. In that case it was never a direct cost. Most of this has to do with proper accounting. My standard business plan financials series includes What’s Accrual Accounting and Why Do You Care, which is directly related. When in doubt, please read that one. Once you have sales forecast and direct costs, you can calculate your estimated gross margin. Gross Margin is sales less direct costs. Gross Margin is a useful basis of comparison between different industries and between companies within the same industry. You can find guidelines and rules of thumb for different industries that give you an industry profile or average gross margin for different industries. For example, industry profiles will tell you that the average gross margin for retail sporting goods is 43%. Every business is different, but knowing the standards and averages gives you some useful comparisons. The distinction isn’t always obvious. For example, manufacturing and assembly labor are supposed to be included in direct costs, but factory workers are paid sometimes when there is no job to work on. And some professional firms put lawyers’ accountants’ or consultants’ salaries into direct costs. These are judgment calls. When I was a young associate in a brand-name management consulting firm, I had to assign all of my 40 hour work week to specific consulting jobs for cost accounting. Garrett can easily calculate the gross margin he’s projecting with his sales forecast. 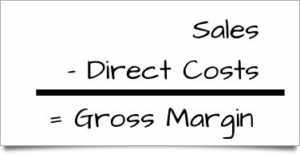 The illustration below shows his simple calculation of gross margin using his sales and direct costs. How do I know what numbers to use? But how do you know what numbers to put into your sales forecast? The math may be simple, yes, but this is predicting the future; and humans don’t do that well. Don’t try to guess the future accurately for months in advance. Instead, aim for making clear assumptions and understanding what drives sales, such as web traffic and conversions, in one example, or the direct sales pipeline and leads, in another. And you review results every month, and revise your forecast. Your educated guesses become more accurate over time. Experience in the field is a huge advantage. In the example above, Garrett the bike storeowner has ample experience with past sales. He doesn’t know accounting or technical forecasting, but he knows his bicycle store and the bicycle business. He’s aware of changes in the market, and his own store’s promotions, and other factors that business owners know. He’s comfortable making educated guesses. In another example that follows, the café startup entrepreneur makes guesses based on her experience as an employee. Use past results as a guide. Use results from the recent past if your business has them. Start a forecast by putting last year’s numbers into next year’s forecast, and then focus on what might be different this year from next. Do you have new opportunities that will make sales grow? New marketing activities, promotions? Then increase the forecast. New competition, and new problems? Nobody wants to forecast decreasing sales, but if that’s likely, you need to deal with it by cutting costs or changing your focus. Start with your best guess, and follow up. Update your forecast each month. Compare the actual results to the forecast. You will get better at forecasting. Your business will teach you. What? You say you can’t forecast because your business or product is new? Join the club. Lots of people start new businesses, or new groups or divisions or products or territories within existing businesses, and can’t turn to existing data to forecast the future. Think of the weather experts doing a 10-day forecast. Of course they don’t know the future, but they have some relevant information and they have some experience in the field. They look at weather drivers such as high and low pressure areas, wind directions, cloud formations, storms gathering elsewhere. They consider past experience, so they know how these same factors have generally behaved in the past. And they make educated guesses. When they project a high of 85 and low of 55 tomorrow, those are educated guesses. To forecast sales for a new restaurant first draw a map of tables and chairs and then estimate how many meals per mealtime at capacity, and in the beginning. It’s not a random number; it’s a matter of how many people come in. So a restaurant that seats 36 people at a time might assume it can sell a maximum of 50 lunches when it is absolutely jammed, with some people eating early and some late for their lunch hours. And maybe that’s just 20 lunches per day the first month, then 25 the second month, and so on. Apply some reasonable assumption to a month, and you have some idea. To forecast sales for a new mobile app, you might get data from the Apple and Android mobile app stores about average downloads for different apps. And a good web search might reveal some anecdotal evidence, blog posts and news stories perhaps, about the ramp-up of existing apps that were successful. Get those numbers and think about how your case might be different. And maybe you drive downloads with a website, so you can predict traffic on your website from past experience and then assume a percentage of web visitors who will download the app. So you take the information related to what I’m calling sales drivers, and apply common sense to it, human judgment, and then make your educated guesses. As more information becomes available — like the first month’s sales, for example – you add that into the mix, and revise or not, depending on how well it matches your expectations. It’s not a one-time forecast that you have to live with as the months go by. It’s all part of the lean planning process. Thank you for this great informations I really learn a lot.